As most '90s and '00s kids will remember, the night of a Harry Potter book release was a huge deal. When I was a kid, my dad was the general manager for a restaurant and a dining train in town — one that he turned into the Hogwarts Express for the release night of every new HP book. I remember carrying big boxes of books that had warning stickers screaming, "DO NOT OPEN UNTIL MIDNIGHT," and feeling like I was holding the most important objects in the world. There was a sorting hat, brooms, wands, magic tricks, Marauder's maps, floating candles, and more within every train car. It was pure magic. By the time the night was over, no one wanted to stick around once the books were out of the boxes and into the hands of fans. I rushed home, locked my door, and read until the sun rose. There was nothing more important to any HP kid than that first read-through. Finding out what Harry was up to next, what adventures he'd go on, and all the new characters to meet was almost too much to handle. It was a blessing that most of the Harry Potter books were published during the summer, because otherwise schoolwork and exams would've been ignored. However, summertime in the late '90s and early '00s were full of beach days, ANTM marathons, and sleepovers. Nothing, however, was as important as clearing your schedule to make time for the new book. The problem: if you didn't have a job, your allowance money was already going to the new book. But, you wanted Harry Potter robes, scarves, wands, candy, and more! If you didn't have the funds, you got crafty and made some yourself. If you managed to find a ride willing to pick you up after midnight at the closest bookstore, you were one lucky duck. You definitely brought along all of your HP friends, and together, you spent the night discussing fan theories, playing Harry Potter themed games, and arguing over your favorite characters. 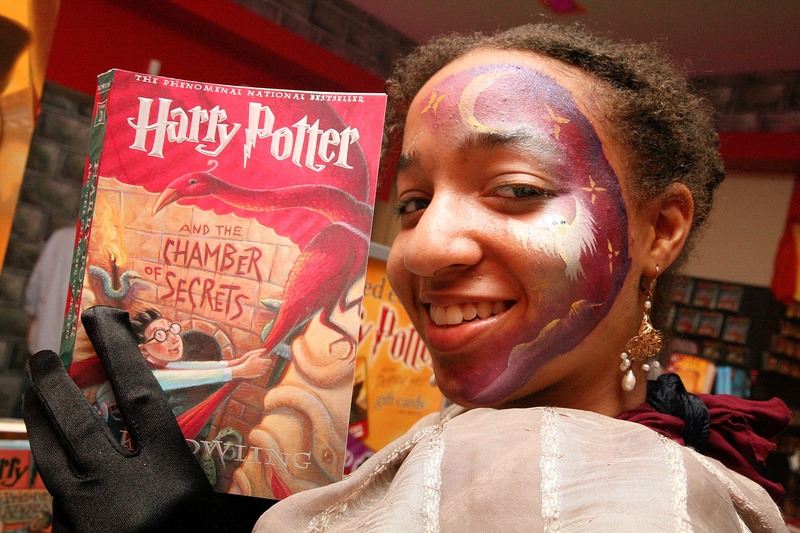 Some people threw their own Harry Potter parties, while others partied at malls and launch events. No matter where you wound up, you had the book in hand at the end of the night. Once you laid your hands on the precious gem, you refused to let go. There were definitely tears involved. If anyone tried to take the book from you, you would've pulled a full-Hermione and punched them in the face. It didn't matter if your mom wanted you to attend a family event the next morning or if your non-reader friend had a big birthday party planned. There was nothing more important than reading every single line in this book. You had a full night of laughing, weeping, and screaming ahead of you. If — by some twist of fate — you didn't read the book in one night, you kept yourself locked away from any possible spoilers. If it meant you had to be a hermit for a few days, then so be it. Even though your dad told you that bringing a massive HP book to the mall, work, or school wasn't going to be helpful, you did it anyway. Where you went, the book went. The glory of growing up as a book nerd in the '00s was that back to school meant you had so many new people to talk to about the newest HP book. Talk flooded the halls quicker than any lame rumor, and you never got tired of it. You made eye contact and formed a bond with anyone who took it out during study hall or honestly anyone you saw reading it. Even if you weren't in school during the time HP books were coming out, the chatter that surrounded it lasted in your workplace or group of friends for as long as it took until the next Harry Potter book came along.